California ended 40 years of reliance on categorical funding for schools when Governor Jerry Brown signed the Local Control Funding Formula (LCFF) into law on July 1, 2013. LCFF intends to enhance services for high-needs students through new flexibility, targeted student funding, and local accountability. Two years into LCFF implementation, our research in 18 districts and more than half of the state’s County Offices of Education (COEs) uncovers both reasons for optimism and a few concerns. District officials around the state remain enthusiastic about local control. Many report that the LCFF has allowed their district to focus more on supports and services for their high-needs students, improve their budget development and strategic planning processes, and increase community engagement. District and COE officials are nearly unanimous that fully implementing the LCFF will take more time and no one we interviewed favors a return to categorical funding. However, implementation of the LCFF is creating an uneasy tension between local control and compliance that threatens to undermine the vision. produce LCAPs that are neither readable by nor accessible to the public. The districts in our study made strong efforts to engage stakeholders in LCAP development by embracing a variety of strategies to solicit input. However, meaningful stakeholder engagement is very much a work-in-progress. The general confusion surrounding LCAP development led many districts to scale back Year 2 engagement efforts. Regardless, many districts experienced an increase in interest group activity in Year 2, often resulting in the “loudest voices” playing a disproportionate role in shaping the LCAP. 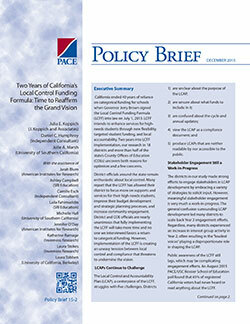 Public awareness of the LCFF still lags, which may be complicating engagement efforts. An August 2015 PACE/USC Rossier School of Education poll found that 65% of registered California voters had never heard or read anything about the LCFF. District capacity—having adequate personnel, expertise, fully functioning data systems and services—could make or break the LCFF. Relatedly, COEs play a key mediating role in LCFF implementation, but variation in their capacity contributed to inconsistent guidance and support to districts. Among the most pressing long-term challenges to successful LCFF implementation may be California’s emerging teacher shortage. Many of our study districts already have experienced teacher shortages or were concerned that shortages will increase over the next few years, hampering their ability to make good on increased program and service commitments for target student populations.